Hakusan, Japan, March 4, 2013 – Eizo Nanao Corporation (TSE: 6737) today announced the 23-inch RadiForce MS235WT, the second multitouch solution in the RadiForce MX Series of clinical review monitors. The MX Series is uniquely designed to meet the needs of a filmless environment where clinical records and medical DICOM images need to be displayed. Both intuitive and enjoyable to work with, multitouch lets you tap, scroll, drag, pinch, spin, etc. with your fingers instead of a mouse and keyboard. The multitouch interface is supported by Windows 8 and 7 and works with the growing number of multitouch applications compatible with these OS. Designed with a perfectly flat top surface, the RadiForce MS235WT offers you touch operation that reaches to the edge or corner of the display area without being obstructed by the bezel. The smooth surface also allows for easy cleaning of dust and fingerprints from the screen. The RadiForce MS235WT comes with a "LaidBack" stand that allows you to tilt the monitor back; ideal for touch pen use. By utilizing an energy-efficient LED backlight, the monitor is able to maintain high-brightness and low power consumption at the same time. The RadiForce MS235WT meets the strictest medical and safety standards for user assurance for installation in clinics and hospitals. 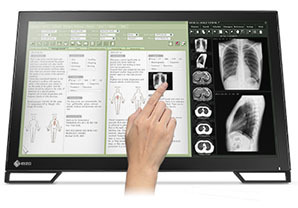 EIZO will demonstrate this new model at the European Congress of Radiology 2013 (ECR 2013), to be held from March 8th to 11th in Vienna, Austria at the Austria Center. EIZO will be located in Extension Expo A, #10. Production of the RadiForce MS235WT is planned for June 2013. Date of availability varies by country so please contact the EIZO subsidiary or distributor in your country or territory for details. Founded in 1968, Eizo Nanao Corporation is a leading global manufacturer of high-end visual display products. The image quality, long-term reliability, and innovative features of EIZO monitors make them the products of choice in many financial trading rooms, back offices, hospitals, air traffic control centers, and design studios throughout the world. EIZO is based in Japan and is listed on the first section of the Tokyo Stock Exchange. It is represented in over sixty countries by a network of subsidiaries and exclusive distributors.